I know I have been dragging the events of this bachelorette party weekend out, but there is just so much to show and tell of this glorious weekend in an awesome town! I’m cursed when it comes to the morning after a night of drinking. My eyes pop open at the slightest glimmer of dawn regardless of the pillow covering my face. I lay in bed, trying desperately to convince my brain it isn’t time to get up yet as I roll over and cover my entire body with my sheets. My head threatens to spin me toward nauseum, qnd I finally push out of bed and stomp toward the bathroom, knowing the only cure for my spins is warm water running over my face. I soak in the shower and slowly put myself together. I climb gingerly up the stairs to the main floor where my blessed roommates are sleeping soundly through their hangovers. I make myself a cup of instant coffee which is surprisingly good and scarf down a protein bar and ibuprofen. I let my friends sleep in, not wishing the same fate of feelings on any of them, but then I remember. 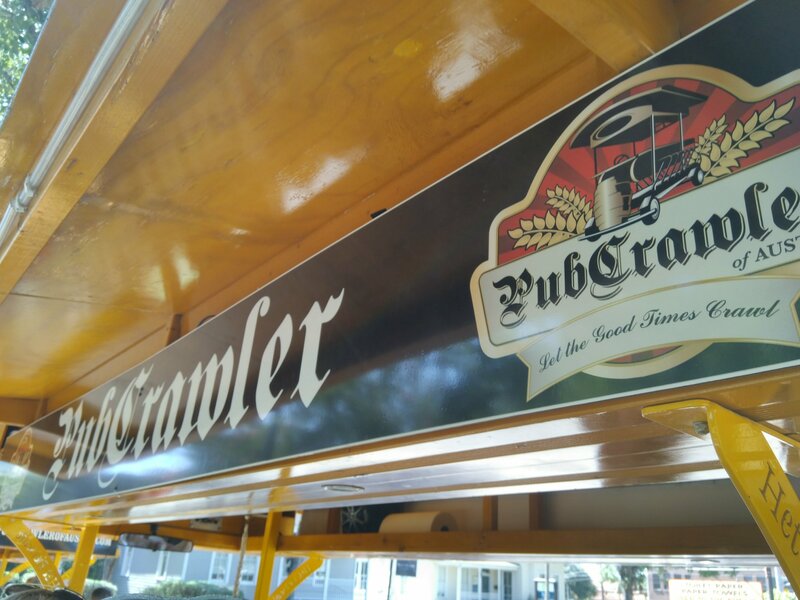 While in our inebriated state the night before, we scheduled an early Pubcrawler experience! If you’ve never heard of it, let me tell you what an experience that was! You jump on a mobile bar with peddles beneath your seat, and a bartender/guide is only steering and serving you for two hours through the town. We made three stops with multiple bars in the vicinity and got to see what Austin looked like in the daytime. Every stop we made, we entered a different type of venue including the Tiniest Bar in Texas, Fado Irish Pub, and Rustic Tap. All excellent choices, and all a great time! We played music the entire ride through Downtown, drank the drinks we brought with us, and had a drink at each stop. A little hair of the dog action. Our guide was fantastic, funny, and showed us a good time, but nothing could have prepared us for the fantastic workout our bodies generously thanked us for following the end of the ride. It may not have been the best idea following a hangover, but it is a great memory. I would recommend this type of event, whether in Austin on the Pubcrawler or any town that has a similar version.